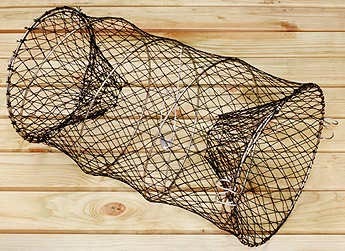 Buy this outstanding and productive crayfish trap and it will keep you in crayfish for years to come. A section of the Trapper Arne inventory. On the third shelf from the top, you will notice a row of expanded JACKPOT traps. 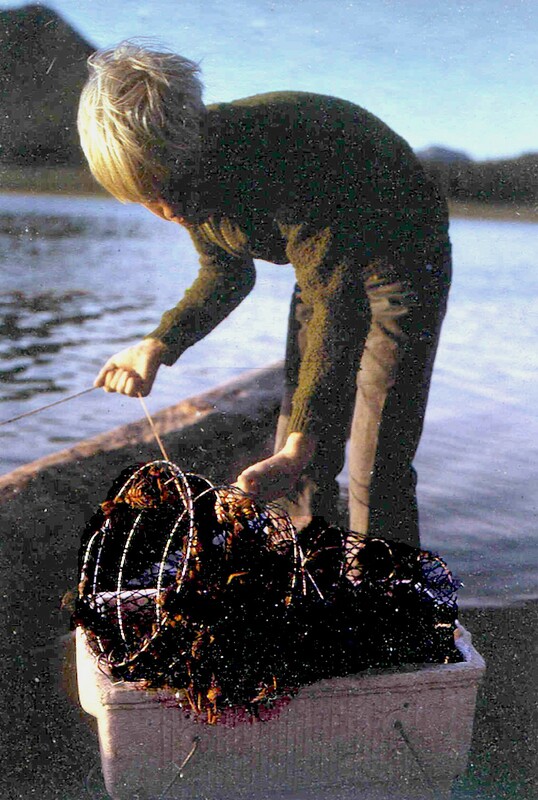 This is the famous Swedish crayfish trap that has been in vogue for ages. I personally still have some of the Jackpot traps that are nearly 30 years old - yet still going strong. The Jackpot trap is highly collapsible which is a great advantage when you go backpacking or fishing with many traps in your boat. In the lower left corner of the picture you can see ten collapsed Jackpot traps not taking any more space than one expanded trap. You can even bait this trap while it is collapsed which may also be an advantage when handling many traps. 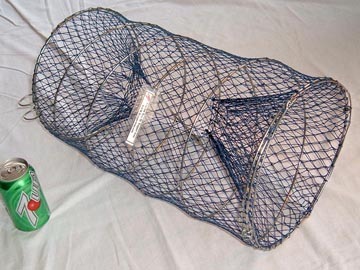 The JACKPOT trap is made with nylon netting over a stainless steel spiral. This spiral is what makes it collapsible into practically nothing. The Jackpot trap is a light trap but quickly sinks to find its place on the bottom of the lake. One end of this trap can be opened for baiting the trap or for removing the catch. As this trap has no rigid ring at the funnel entrance, it can not be equipped with an escape stopper. 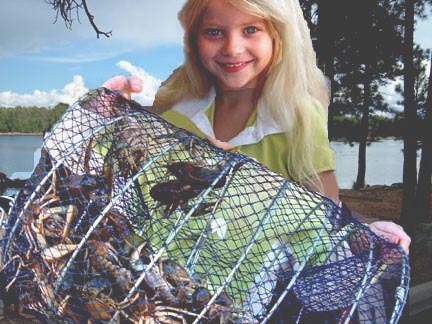 Make sure you empty this trap before all the bait is gone, or the crayfish eventually will find the exit and be gone. Leaving the trap in for three of four hours before harvesting will maximize your catch. Measurements: length: 18" (collapsed 1 1/2") - diam: 10" - weight: 1 lb 8 Oz. - Mesh size: 1/2" - trap entrance 2 1/2". No wonder most modern and productive crayfish traps stick to the tubular design of this Swedish import. Boxy traps may catch crayfish, but their design is flawed. They tend to get stuck on rocks and other bottom debris. The round trap seldom gets stuck and has the advantage of landing on the lake bottom so that crayfish easily will find a way in to the tempting bait. My granddaughter Annika enjoyed demonstrating a jackpot trap at Willow Springs Lake. Here is a Jackpot trap in action many years ago. My son Peter is preparing to dump a large catch into a styrofoam cooler. The lake is Wheatfields Lake on the Navajo Reservation. On 'mouse-over' you will also see my friend John with two well filled jackpot traps. This picture is out of focus, but I couldn't resist showing it again. It is my favorite trap picture. If this picture were sharp and in color, it would be a real trap seller. My son Peter and I went to the Navajo Reservation to catch crayfish one summer. We were overwhelmed by the abundance of crayfish in the lake. In this picture Peter has difficulty holding up an exceptional catch - about 45 - some of those traps brought up from the trout lake after three or four hours. No wonder we went back many times. 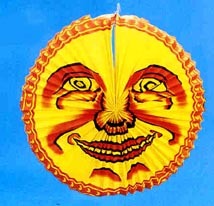 This picture shows the simplicity in design of the JACKPOT trap. Maybe that simplicity is what makes it so productive. After all, it has been a popular trap in Sweden since I was a kid. As with all other Trapper Arne traps, this trap has a bait clip between the two halves of the trap. Some fishermen prefer using a bait container in the trap instead of a clip. 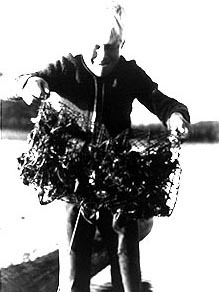 A container prevents crayfish from eating the bait which will therefore last longer. When using a container, it should be positioned to hang in the middle of the trap. 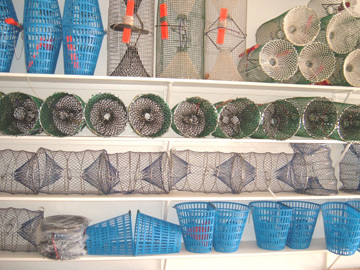 to buy the JACKPOT Crayfish Trap? YES!